For other ships with the same name, see List of ships named Iris. Iris was a schooner launched at Port Huron, Michigan, in 1866. She spent 47 years sailing the Great Lakes; for most of this time she was based out of Detroit Harbor, Wisconsin. 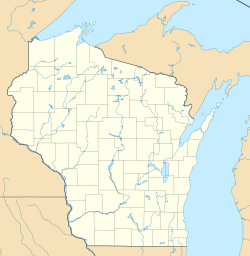 In 1913 she sank in Lake Michigan off the coast of Washington Island in Door County, Wisconsin, United States. Her crew abandoned her after she ran aground. In 2006, the shipwreck site was added to the U.S. National Register of Historic Places. ^ "Iris Shipwreck". Wisconsin Historical Society. Retrieved 2012-02-10. ^ "What sites are underwater?". www.nps.gov. Retrieved 3 October 2014. ^ "Iris (Shipwreck)". Landmark Hunter.com. Retrieved 2012-02-10. This article about a property in Wisconsin on the National Register of Historic Places is a stub. You can help Wikipedia by expanding it. This page was last edited on 13 October 2018, at 02:56 (UTC).